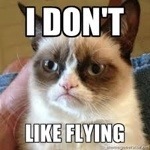 I’m not a huge fan of flying. I’m not afraid of it. I just don’t love it. It can be cramped and the roar makes my head feel funny. And I’m always nervous that I’ve forgotten some very important document and will end up with a little black mark in my file that I imagine the US government keeps on all of us. The whole thing is just a little unnerving. There is one aspect I love about flying however. I LOVE that for the entirety of my flight I am out of reach. No emails to answer. No phone calls to return. No one making any sort of demands on me or my time. No matter how busy I was before I boarded that flight, once we’re airborne, I’m free! Everything has to wait. Life gets put on hold for those precious hours until I land. (Except in those awful planes that are now offering wifi. That is such a terrible idea!) It also serves as a great reminder of just how little I’m needed. Seriously. In a good way. Most of us aren’t so important that emails and phone calls can’t wait a while. Our constantly dinging/ringing/buzzing phones help us think we are in high demand at all hours of the day. We really aren’t as important as we like to think we are and we can use that reminder every so often. As I now wait to board my flight to Scotland, I sit at the terminal thinking about that long flight and how I won’t have any obligations during it except to be a responsible passenger, to be kind to my neighbors, and to dream about my future days in the Motherland. What if we treated Sabbath like a long, full-day flight? Not taking calls, not answering emails and not allowing any demands to weigh on us until the next day. Would thinking of Sabbath the same way we think of flying help us remove all those distractions that hamper our rest and worship? All we’d have to do on our airplane sabbath is to be kind to others as we engage in holy community, let our minds wander in wonder, and to be present to the ways God is working in the world. In preparation for this trip, I asked many friends and family not to text or call me. I can’t answer calls in a foreign country and don’t want to use my few precious allowed texts if it’s not an emergency. It helps me to know that they are on board with the plan. They are, in no small way, supporting my time away by keeping their distance over the next few days. What if our friends and family and even our employers were on board with our plans for Sabbath? Would it help if others knew that you wouldn’t be returning calls or emails during your scheduled time for rest and worship? Would you feel free to worship, serve, and sleep if you were untethered to things that only serve to distract us during those very urgent non-emergencies? Announcing that I’d be away was one of the most freeing things I’ve ever done. Imagine if we did that every single week as an act of Sabbath. Is it a challenge to prepare for an at-home airplane sabbath? Sure! (See my earlier post on getting it all done). But it’s all worth it to board that sabbath plane knowing you have no demands for the day. Shortly, I’ll board my flight to Sabbathville, I mean, Scotland. I’ll take your “very important” calls when I return.